Time to visit the past relationship between law-breakers and cops, since the issue has been dominating the news after Ferguson, Mo. and New York City incidents. It’s not the first time a segment of society supported thugs over police. One infamous crook robbed police stations, killed a policeman, and became a folk hero, still celebrated today by some. John Dillinger is better known for robbing banks and being betrayed by a female friend wearing a red dress. The myth is she wore the red dress to the Biograph Movie Theater she attended with Dillinger so the Feds would easily spot them. She actually wore a white blouse and orange skirt, not that anyone cares. Dillinger was shot and killed that night. During his short life, Dillinger became a folk hero in some circles. Unlike today’s criticism of police, which has strong racial overtones, Dillinger’s supporters were those suffering from the collapse of the economy. Some were poor people who saw Dillinger exacting retribution against the wealthy banks and bankers. They also saw law enforcement as an extension of corrupt government. Though the F.B.I. denies on its website that Dillinger had any Robin Hood like traits, there are an abundance of anecdotal stories about his giving money to poor children and families who were suffering financially. People who believed the banks were corrupt along with the government (sound familiar?) 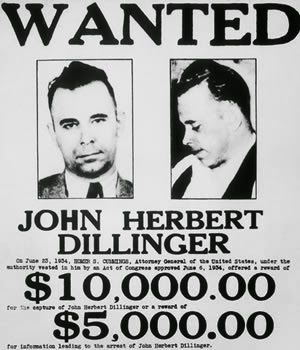 cheered Dillinger and his gang on for “sticking it to the man.” No doubt Dillinger performed some charitable acts, but most of his ill-gotten gains were likely spent by him and his gang. Now to the Texas connection. There is a club of sorts that has been in existence since 1966 called The John Dillinger Died For You Society. This organization was birthed in Austin, Texas that year at the famous Scholz Garten (sometimes called Scholz Beer Garden) by a group of University of Texas students and their professor. Seems that one of the students had completed his thesis on the subject of the Thompson Machine Gun and was there celebrating with his professor and friends. Sometime, probably after many pitchers of cold beer, they formed the club. Each member was designated as an “assistant treasurer” and authorized to collect dues from any new member, supposedly because that’s the way Saint John would have wanted it. The Club’s still in existence today! On the anniversary of Dillinger’s death, members trek to the site of the Biograph Theater where Dillinger was gunned down, play the bagpipes, pour beer on the spot where his body lay, and celebrate his…not quite sure what, maybe his notoriety or could it be, just an excuse to lift a mug. At any rate, for those interested, there are three Facebook pages for The John Dillinger Died For You Society. One is categorized as simply a “public group,” the second as a “church/religiousorganization” and perhaps the most appropriate is a “bank/financial institution” group. But most important, do you know the name of the police officer he murdered? That officer’s name can’t be found in the FBI’s story, but he was William Patrick O’Malley, an East Chicago police officer. He left a wife and three children. I’ll publish a story about him soon. Good story. But the thing that popped out to me is the fact a student could complete – and get credit – for a thesis about the Thompson Machine Gun. Must have been a fun course.